Four years ago, Israeli forces and Hamas militants fought a 50-day war. The fighting caused heavy damage to many buildings, roads and other infrastructure in the Gaza Strip. Now, Israel fears a humanitarian disaster along its border. The country is appealing to the world to provide support for a series of development projects in Gaza. Qatar has become an unlikely partner in the Israeli effort. The wealthy Gulf state has offered to donate money and is urging other nations to do so. But, it remains unclear whether the rest of the international community is ready to help. Donors have noted some successes in rebuilding Gaza since the 2014 war. But they say Israeli government officials are still too slow in approving projects. And they say Israel’s blockade of Hamas-ruled Gaza is working against the goal of developing the territory’s economy. Gaza is a small piece of land between Israel, Egypt and the Mediterranean Sea. Conditions there have worsened since Hamas militants seized the area in 2007. The militants took away control from the Palestinian Authority. Israel and Egypt set up a blockade in an attempt to weaken Hamas. Palestinian President Mahmoud Abbas has increased pressure on Hamas by cutting wages of public servants and limiting electricity. He hopes his administration can regain control of the territory. Israel and Hamas have fought three conflicts since the group took control of Gaza. The most recent one, in 2014, was especially damaging. The United Nations says nearly 20,000 homes were destroyed, and over 150,000 others were damaged. Hospitals, schools and infrastructure were also damaged. After the fighting ended, international donors gathered in Cairo and came up with a $3.5 billion reconstruction plan. But only 53 percent of the promised money has been donated, according to the World Bank. Gaza’s economy is in trouble. Unemployment is over 40 percent. Public water supplies are undrinkable. And Gazans receive only a few hours of electricity a day. 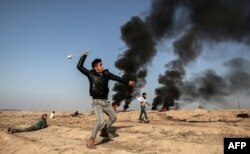 The Associated Press says evidence of problems are clearly noticeable on the streets of Gaza. Many of the roads are in bad condition. Drivers often see young men sitting idly in groups on sidewalks. Many storekeepers spend their time on smartphones since few people are buying their products. And the air is often filled with the smell of waste from the Mediterranean. A Palestinian boy holds cooking pots during a protest against aid cuts, outside United Nations' offices in Gaza City January 24, 2018. Israeli officials blame Hamas for the conditions. They say Israel has no choice but to continue the blockade, which restricts imports and exports, because the group is plotting ways to attack Israel. The militant group has said it wants to destroy the Jewish state. But fearing a humanitarian disaster that could lead to violence, Israel has begun to soften its position. Israel and the international community, however, have different ideas for how to fix the situation. On January 31, Israeli officials appealed to an emergency gathering of donor nations to support delayed projects sought by the international community. The officials said the projects are expected to cost hundreds of millions of dollars. The Israeli list is reported to include a power line, natural gas line, industrial area and waste treatment center. Mohammed Al-Emadi, the head of Qatar’s Gaza reconstruction committee, urged other nations to support the effort. A girl sleeps on a suitcase as she waits with her family for a travel permit to cross into Egypt through the Rafah border crossing after it was opened by Egyptian authorities for humanitarian cases, in the southern Gaza Strip February 8, 2018. Qatar, the United States and the European Union have been leading donors to what is called the “Gaza Reconstruction Mechanism.” The program was set up after the 2014 war to rebuild the territory while avoiding contact with Hamas. Under the effort, the Palestinian Authority leads the projects, while Israeli security officials consider and approve them. The United Nations studies the movement of supplies to make sure that things like cement and metal pipes do not reach Hamas. Israel considers the system to be a success. Israeli reports say nearly 90,000 homes have been rebuilt, while 380 large projects, such as hospitals, housing and water treatment centers, have been completed. Qatar has provided money for some of the biggest projects. These include an $84 million road across Gaza and a $114 million group of buildings in southern Gaza and a modern hospital. U.N. and World Bank officials say the reconstruction mechanism has worked well on normal projects. But they say actions by Israeli officials and security inspections of complex equipment have resulted in delays of up to six months. At the donors’ conference last month, the Israelis promised to ease some restrictions and to speed up work. The World Bank welcomed the steps. UN diplomat Nickolay Mladenov said that for Gaza’s economy to truly recover, the world must direct its attention to bigger goals. These include halting the militant activities of Hamas, permitting the Abbas government to retake control of Gaza and ending the Israeli blockade. Josef Federman wrote this story for the Associated Press. George Grow adapted his report for VOA Learning English. Mario Ritter was the editor.